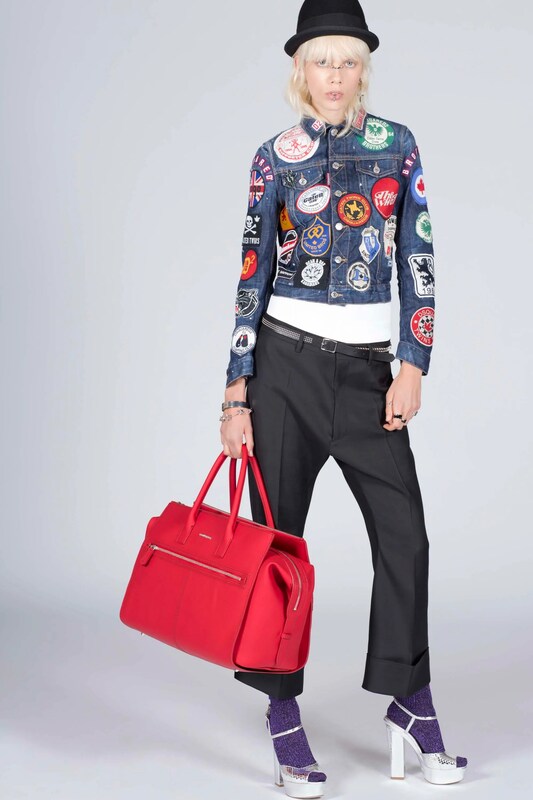 Let your freak…errr…British flag fly with flag and patch detailed bags, unusual nose and lip jewelry, lace-up knee-high peep-toe boots, fedoras and caps, classic cut outerwear and shirting, cropped denim cargo vests, and bleached destroyed denim, the DSquared2 Resort Spring/Summer 2017 womenswear collection mixed the 70’s with a bit of a punk influence. 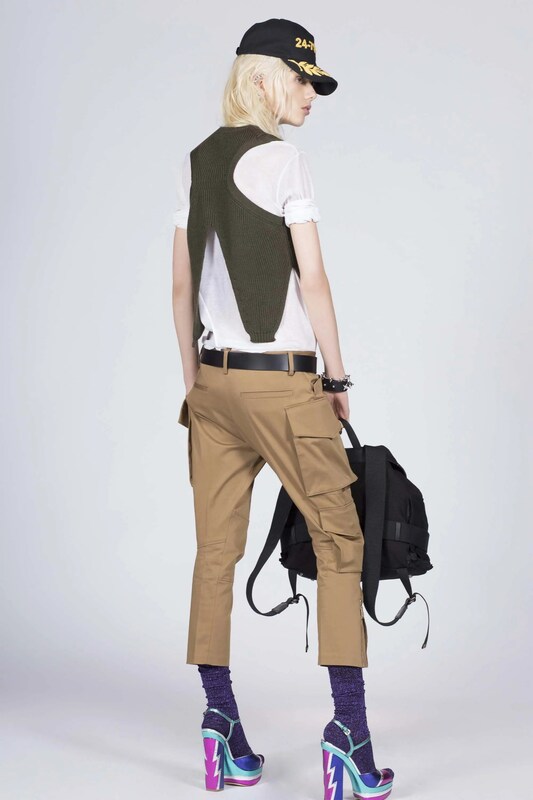 The long moto jacket with utilitarian pockets and contrast sleeves is so striking- it’s touching on three motifs we’re seeing on the runways for both menswear and womenswear- contrast sleeves, cargo pockets, and lengthy layers- it gives off the appearance of being a vest over a shirt and coat. Sequin camo and zebra, cute character graphic t-shirts, racer check print, stripes, metallic leather jackets and dresses, and a Bowie influence in the fit of the red suit and also thunderbolt metal collar- the nods to the 70’s are evident in the fit, tailoring- peaked lapels, semi-flared legs- prints such as the stripes and classic suiting and shirting. 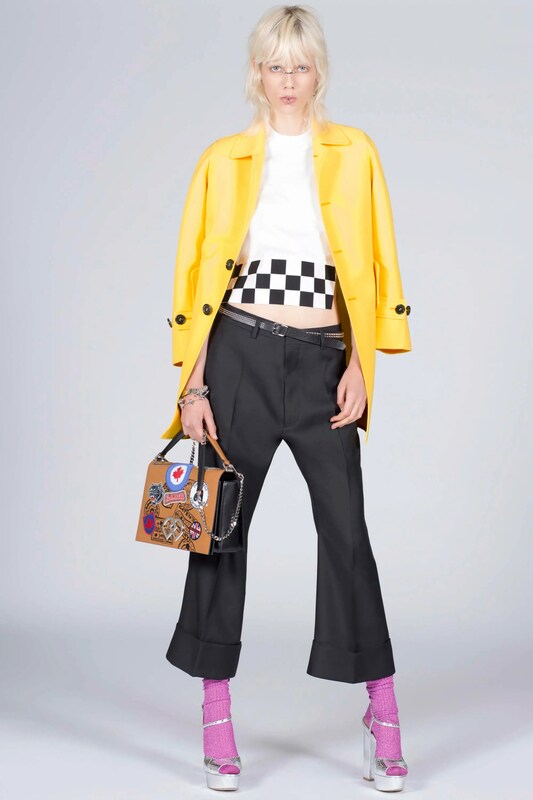 The DSquared Resort SS17 womenswear collection was seemingly made for Gwen Stefani- it was trendy, in your face, wearable, and juxtaposed nouveau and classical.